Brighton Ford has over forty 2018 Ford EcoSports in at our dealership near Novi and wanted to share our first thoughts with you! The all new EcoSport is a compact crossover SUV perfect for those who choose their own path! Starting at $19,995 with seating for 5, this is one affordable, practical and stylish ride for those looking to get great gas mileage in a safe utility vehicle. This small SUV sure packs such a huge punch! The value is amazing for the price of this Ford and 29 miles per gallon on the highway is quite impressive as well! Schedule a test drive today by calling Michael Tabacchi, Senior Salesman at Brighton Ford: 810-494-4222. The EcoSport comes with many options, it’s available in S, SE, SES and if you want all of the bells and whistles it’s also available in Titanium (like the one in the video)! With available heated seats, heated steering wheel, blind spot information system (BLIS), 17” stainless aluminum wheels, Standard AdvanceTrac with Roll Stability Control, trailer tow prep package, SYNC 3, reverse sensing system and so much more. There’s plenty of room for storage and the entire family, and the technology is amazing on the all-new EcoSport. Unexpected, amazing connectivity is now standard. SYNC® 3 with Apple CarPlay™ and Android Auto™ compatibility gives you all your favorite apps. Available Wi-Fi hotspot keeps you connected even remotely with SYNC Connect. 1. Our exclusive EcoBoost engines have proven their exhilarating performance. The standard 1.0L in the 2018 Ford EcoSport is no exception. Turbocharged and with direct injection, it delivers more bang for the buck. You’ll smile every time you tap the accelerator. 2. The 2.0L Ti-VCT (GDI) engine is paired with Intelligent 4WD, offering enhanced handling in any climate and on any road. Take the 2018 EcoSport for a spin at Brighton Ford today! Hi there! Our names are Batman and Cinder. We are two very handsome medium haired bonded brothers. We are a pair of commendable (neutered) males who truly enjoy your presence. Our past family says we have been around all ages, meaning adults, seniors and children and seem to do fine! We are friendly, tolerant and when in the mood – playful! We are considered seniors as we are both 8 years old. Did we mention that we are BIOLOGICAL brothers? We prefer to be the only cats and would do best without other animals. We are both very loving and sweet boys. 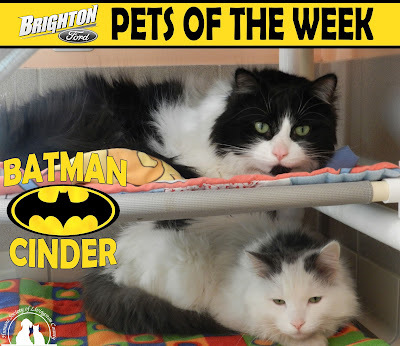 Batman is an 8 year old male who is black and white and Cinder is an 8 year old male who is grey and white. Need a way to transport your pets? 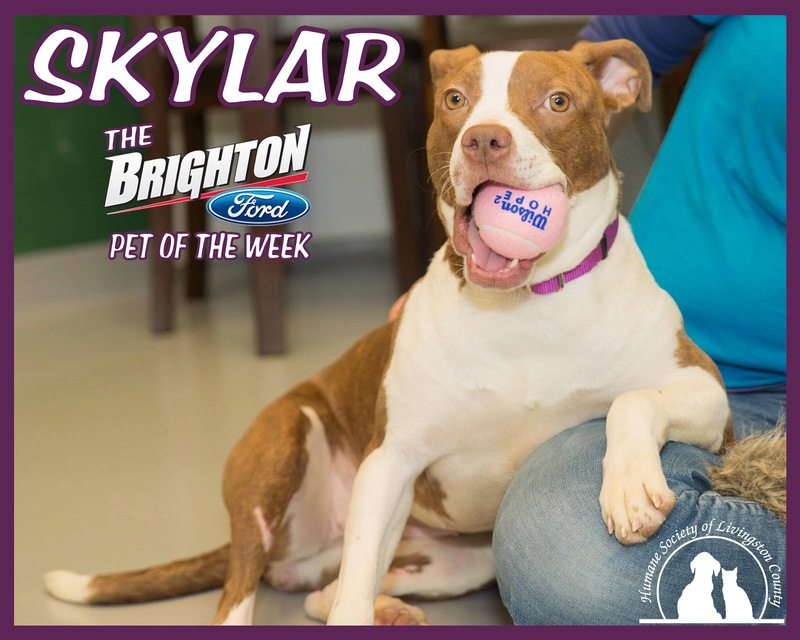 Brighton Ford has the new and used cars, trucks and SUVs perfect for taking your pets to the park, pet store or out to Kensington for a nice walk around the lake! Meals on Wheels of Livingston & Western Oakland County needs volunteers! We would love the opportunity for you to be part of our team. This is a commitment of 1-2 hours of your time as little or as often as your schedule will allow…once a month, once a week, temporarily or on a continuous basis. YOUR HELP IS NEEDED FOR THIS AMAZING ORGANIZATION! If a pothole causes damage to your vehicle, it’s sometimes possible to be repaid by the city, county, or state for some or all of the repairs. The first step is to fill out this form from the Michigan Department of Transportation. The form must be notarized, which can be done for free at many banks, and all written estimates/receipts need to be included. Then take the completed form and documentation to any MDOT office. Proof of insurance and receipts of estimates/repairs are required along with this form. They can either be mailed or brought to the Wayne County Risk Management Claims Division, 500 Griswold, 20th Floor, Detroit. This form can either be mailed, emailed or faxed to the Macomb County Department of Roads. The county suggests attaching photographs. This is the only county where everything can be done online here. An electronic signature and the contact info for witnesses are required to complete the claim. The city requires the most proof when it comes to getting reimbursed for a damaged car. You must include a copy of your insurance and registration along with photographs of the damage. Three estimates have to be included and sent to the City of Detroit Law Department Claims Section along with this form. Don’t forget to have it notarized. The Lansing State Journal investigated damage claims paid out by MDOT and the city of Lansing. 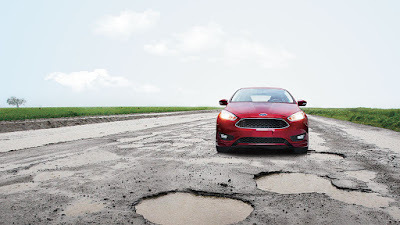 They reported that the chances of reimbursed for damages are low, sometimes zero, as the agency must have been notified about the pothole by another motorist before the damaged vehicle hit it. Give Brighton Ford a chance to earn your business! Bring your car, truck or SUV in from Howell, Pinckney, Brighton, Fenton, South Lyon, Lyon Township, New Hudson, Hartland, Ann Arbor, Novi, Wixom, Milford and you are sure to be impressed with our amazing customer service. Many of our new and used Ford trucks, cars and SUVs come equipped with FordPass. FordPass is an app on your smartphone that can be used to make your life much easier! You can find and pre-pay for parking in Downtown Detroit for your next event, you can also schedule your next service appointment to keep up with your Ford’s maintenance and repairs and so much more. If properly equipped, you can even start your Ford vehicle from anywhere in the world with FordPass! Many new Ford Explorers, F-150s, Escapes and Fusions come with FordPass, search our inventory here to find your new Ford today. Join Brighton Ford as we proudly sponsor the Oakland Livingston Human Service Agency’s 28th Annual Walk for Warmth event on Saturday, Feb. 24. Registration at 8:30am, kick-off at 9:00am. Walk for Warmth is an indoor walk-a-thon event held at the Hartland Educational Support Service Center. Funds raised will help our neighbors in Livingston County stay safe and warm this winter through emergency services provided by OLHSA, a Community Action Agency. 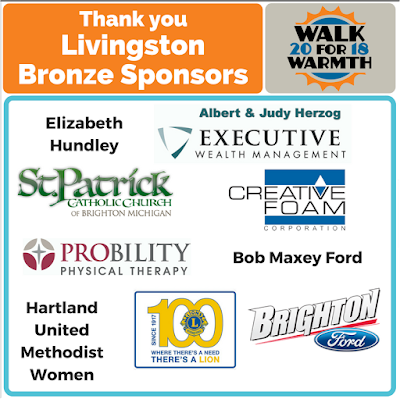 100% of funds raised in Livingston County go towards helping Livingston County residents. Our goal is to raise $100,000! Will you help us? Get some exercise on a winter morning and help others at the same time. Walkers will jam out to DJ Kurt Lewis as they walk the .25 mile indoor loop. New this year – fairy tale celebrities will join the Walk! Kids can meet and greet their favorite characters and enjoy other family entertainment. OLHSA, a Community Action Agency, through collaboration and partnership, empowers people in need of our assistance who live in the communities we serve, to gain the knowledge, skills, and resources to improve the quality of their lives. Our new compact utility vehicle does it all! The Ford EcoSport is new to America and Brighton Ford has plenty to choose from right here on our lot just east of Lansing, Michigan! Adopt Skylar From The Humane Society of Livingston County Today! Hi Everyone, I'm Skylar! I'm a 2 year old brown and white mixed breed! I'm spayed, micro-chipped, and up to date on vaccines! I was found wandering the streets of Detroit when some nice people picked me up and took me to DACC and they transferred me here! 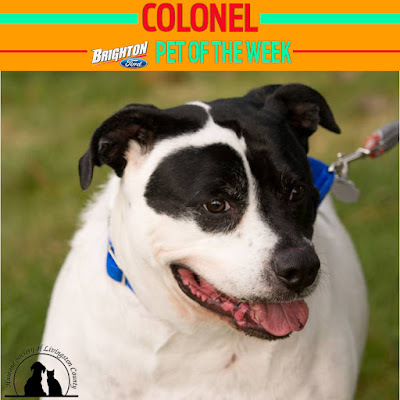 I would benefit if my new family took me to basic obedience classes so I can learn to be the best companion ever! I love to play outside in the yard with the staff here and play with toys! I will require a fenced in backyard in my new home since I was found as a stray. I may be able to live with another dog in the home, it would be on a case by case basis! I would do best with a family with older children because I am very jumpy right now but I'm working on that! SUVs figured in Ford's electric vehicle presentation. The automaker's president of global markets, Jim Farley, said on Sunday that Ford would bring a high-performance electric utility vehicle to market by 2020. The company will begin production of a hybrid version of its popular F-150 truck at a plant in Dearborn, Michigan, in 2020. "What we learned from this first cycle of electrification is people want really nice products," Farley said. Make A Difference & Volunteer For Salvation Army Of Livingston County This Spring! HAVE YOU GOT SOME TIME TO VOLUNTEER? Volunteers are needed to be part of the Planning Committee for this special event that will be held on Saturday, September 22. If you would like to help plan, coordinate, and serve on this committee, please contact April Dertian at april_dertian@usc.salvationarmy.org or 517-295-4344 for further details regarding meeting dates and details of the event. 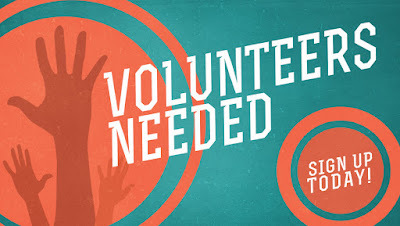 Volunteers are needed to help sort and organize the Summer Lunch Bunch supplies and get things ready for the summer. We will be meeting at the Corps Warehouse on Friday, February 23 (9:00 a.m. – 12:00 p.m.) and on Friday March 9th (9:00 a.m. – 12:00 p.m.).Wear your grubby clothes and help us get organized! The Salvation Army of Livingston County is looking for a friendly, energetic person to volunteer long-term in our reception area. You will be the first contact for people who are looking for information and help during a time of need, so a caring heart and a warm smile are a must. This is a rewarding opportunity for those who seek to make a real difference in their community.We are seeking volunteers who are interested in a commitment of 1 day per week over a minimum 6-month time frame. The Corps facility is seeking a volunteer to do light maintenance/handyman duties around the building once a week or as your schedule permits. Do you know how to fix a door knob, paint, change a light bulb, other light maintenance, then his is the opportunity for you. Let us know how you can help. We are in the process of putting together an Emergency Disaster Team of Volunteers for The Salvation Army in Livingston County. We need to be ready for any disaster that might occur in our County. Training will be provided. If this is something you are interested in, please contact me for further details. Who’s excited for the all-new 2019 Ford Ranger? The all-new 2019 Ranger has been developed and tested to the demanding standards of Built Ford Tough. It shares a heritage of toughness, durability and capability derived from over 100 years of Ford Trucks’ relentless focus on engineering excellence. This is what freedom looks like today. The all-new 2019 Ranger has the toughness and capability to leave civilization far behind — because adventure begins where the road ends. The proven 2.3L EcoBoost® engine with Auto Start-Stop technology is designed to optimize power and efficiency using turbo-charging and direct gasoline injection. It’s also paired with the innovative, class-exclusive 10-speed automatic transmission. The Ford Ranger will be available in the base XL trim, XLT trim and the LARIAT trim with the FX4 Off-Road Package, so you will have many options for your 2019 Ranger! The FordPass Connect feature in the Ranger can create an in-vehicle Wi-Fi hotspot to which you can connect up to 10 devices, so your passengers can stay in touch wherever you roam. You can also use FordPass™ to keep track of your Wi-Fi data usage. The hotspot can be accessed up to 50 feet outside the vehicle. This video shows you how easy it is to pair your phone to your Ford truck, car or SUV with SYNC 3. With simple step-by-step instructions, you can connect to your phone to make phone calls and texting a breeze when you are driving. Pair with SYNC 3 to make all the time you spend in your Mustang, Expedition, Explorer or F-150 as convenient as possible. Connect your phone via Bluetooth and you can use voice commands to change the radio station, check for traffic updates, navigate to a new location or even reply to a text message. We will help you here at our Brighton Ford dealership located just north of Ann Arbor, but this video is perfect for adding another phone when you get home…or if you get a new phone and would like to pair it yourself. Call our Award Winning Ford Service Department at 810-227-1171 or visit us on the web by clicking here. Check out this loaded 2013 Lincoln MKS with BLIS, navigation, heated steering wheel, leather seats, remote starter, back-up camera, push button start, back-up sensor and so much more! Marked down to $13,727 just for you! Take this luxurious used Lincoln for a spin today: 810-227-1171. We are a BONDED PAIR of front declawed, 8 year old BROTHERS ready to find a home together! We are enjoying time in a foster home. Make an appointment to meet us! We are Boots and Morris, a bonded pair of sweet, 8 year old brothers who are affectionately known as “Boo and Mo” by our foster family. We were born 9/15/2009 and lived together in a very loving home since we were kittens until sadly, our owner developed health issues and could no longer care for us. Losing the only home we ever knew and coming to the shelter was very traumatizing for us, so thankfully, we are now staying in a GREAT foster home where we are relaxed, happy, and ready to find our new FOREVER home! We are used to a quiet, indoor only, adult home, so that would be best for us again. We would be WONDERFUL companions for anyone living alone and would also have each other for companionship if left alone for a short time. We have been ok around some small dogs and other cats, but have never been around children so please keep that in mind. Boots is an adventurous boy who likes to explore, look out the window, and climb the cat tower. He LOVES to be petted and brushed and is a big PURR box! Morris was a bit shy at first, but LOVES to snuggle on your lap and is becoming more confident now to explore and play. They are both VERY affectionate, enjoy a little catnip on occasion, and have excellent litter box habits. They are WONDERFUL, LOVING cats who have adjusted quickly to our home and find comfort in being together! Brighton Ford knows the importance of community, that's why we are doing all we can to give back to Brighton, Howell, Livingston County and surrounding areas! We have been proudly serving our community for over 30 years! Looking for a new or used car, truck or SUV to cart your pets around in? A match made in heaven! The #1 selling SUV over the last 27 years and America’s best selling truck for 41 years and counting! Brighton Ford says Happy Valentine’s Day with two amazing lease prices! Make a date to test drive your favorite today at Brighton Ford near Howell! Brighton Ford is your local South Lyon, Pinckney, Ann Arbor, Lansing and Novi Ford dealership, as we deliver everywhere. Brighton Ford’s Certified Pre-Owned Vehicles give our customers peace-of-mind! Used Ford vehicles with warranties and roadside assistance = huge savings over buying new, with all of the benefits of buying new. Did you graduate college in 2017 or 2018? Brighton Ford has a special program to guarantee you the best interest and lease rates on a brand new Ford vehicle! We know that getting your college degree can be very difficult with everything that happens in life, so giving you the best interest rate and terms on your lease or purchase is our way of rewarding you for all of your hard work! Brighton Ford and Ford Credit have teamed up to offer all 4 year college graduates the best approval through Ford Motor Credit! This offer is good for all new 2017 and 2018 leases and purchases, with terms up to 75 months and A/Z/X/D plans are eligible for this discount. To qualify for this amazing offer, you must be a graduate of an accredited college with a 4 year program in the last year, see dealer for details*.